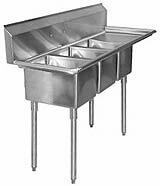 Measurements for AERO 3 Compartment Sink with Left or Right Drainboard. Stainless steel. NSF approved. 74 inch overall length. Compartment size 18" x 18". Use 8 inch center faucet with 14 inch spout. Made in the U.S.A.